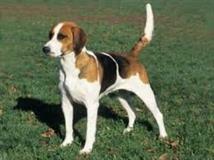 The American Foxhound is descended from English hounds brought to America in 1650. However French hounds have also been involved in the breeding program. The American Foxhound, like the English foxhound is a hunting and field trial dog. They also work exceptionally well in packs and solo. Like the English foxhound they also are expert at: tracking, hunting, being a watchdog and agility. The dogs temperament has variously been described as affectionate and gentle at home, which transforms into a relentless intense hunter in the field. While this permeates through the internet it should be understood that this is a hunter first and foremost. They can make a great companion dog but need firm guidance. Both foxhounds (English and American) are considered by some hunters to be the peak of hunting dogs for foxes, deer and mid-sized prey. It should be realized that in fairness to the dogs and the breed, that all of the information about how good they are with families should be taken in context. With devoted skilled trainers and hunters who legitimately care for these dogs mental states, the dogs can be integrated into a family situation. However without proper skill the dogs will be restless, ‘difficult’ with strangers and highly aggressive to any animal except some dogs. To purposely buy any highly refined hunting dog from a breeder, then withhold their major breed purpose from them, is always going to end up with a dissatisfied dog.